Promotion and branding will give sellers the ability to add their own billboard and be showcased win the marketplace, from the store manager, the links called brand manager and promotion manager will bring up the menus needed to add the branding elements. 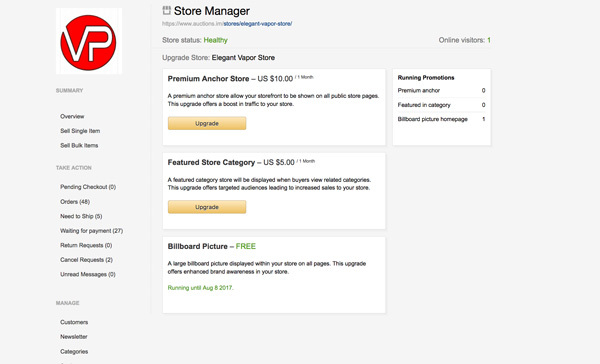 Here sellers can upgrade their store by adding a premium anchor which will allow the storefront to be shown on all public store pages, and also a featured category enhancement which will show the store when buyers view related categories. This upgrade targets buyers per category leading to increased sales store and a boost in traffic. Sellers can also add a billboard picture to appear at the top of the store page, this large billboard picture offers enhanced brand awareness and sellers can pay a fee to add this enhancement. The billboard upgrade will need to be purchased first from the promotion manager before the seller can upload a picture. 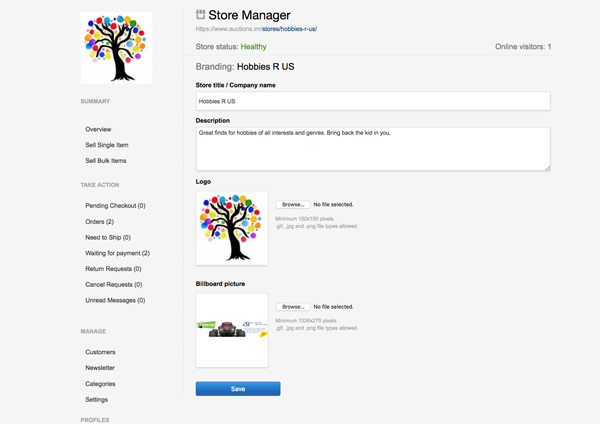 Sellers can always add a logo for no additional cost, plus a title and description for their store.